Opening with a dramatic fanfare, "Joy to the World" and "How Great Our Joy" are seamlessly joined together in this innovative piece filled with vibrant energy. One of our most popular Christmas hymns, the lyrics of "Joy to the World" were paraphrased mostly from the second half of Psalm 98 by Isaac Watts (1674 - 1748) who intended it to celebrate the second coming of Christ, not his birth. It was sung in England to various hymn tunes, but the version we know best here in America is set to a tune arranged by Boston music educator Lowell Mason (1792 - 1872) from fragments of The Messiah by George Frideric Handel (1685 - 1759). "How Great Our Joy" can be traced to a German text possibly dating to 1500, which was "modernized" in 1623, and later translated into English by Theodore Baker (1851 - 1934). The music is a traditional German tune as arranged by Hugo R. Jüngst (1853 - 1923). Dan Forrest is an impressive young composer and arranger who has quickly become one of our favorites. This concert includes two of his arrangements and one composition. He has created a compelling and majestic setting of this favorite carol, ornamented with "Nowells" of striking beauty. "The First Nowell" or "The First Noel", as it is also known, is a 17th century traditional English carol which probably had its origins in France, since Noel is the French word for Christmas. There is also a Cornish version, "O Well, O Well". Some believe that the song was brought to Britain from France by wandering troubadours. It was first published in Carols Ancient and Modern (1823) edited by William Sandys (1792 - 1874) with lyrics by Davies Gilbert (1767 - 1839). British composer John Rutter has been called the most gifted composer of his generation, and he has certainly created some of the most memorable choral music for Christmas and other important occasions, such as royal weddings. This lyrical anthem of thanks to God is a perfect example of his consummate craftsmanship. This lively Hanukkah song was composed by Abe Ellstein and Moyshe Oysher, who have been described as "legendary kings of the Yiddish theater". The arranger, Joshua Jacobson, who is one of the world's leading authorities on Jewish choral music, wrote this English translation especially for us to sing in this concert. As a part of the Hanukkah celebration, children traditionally play with the dreydl, a four-sided spinning top. A unique opening theme created by Dan Forrest is entwined with the familiar carol in this impressive new arrangement with a brilliant four hand piano accompaniment. "Hark! The Herald Angels Sing" was written by the prolific poet and hymnist Charles Wesley soon after he and his brother John founded the movement that became the Methodist denomination. The tune was composed by the incomparable Felix Mendelssohn and is the second chorus from his Festgesang (Opus 68). Dan Forrest's hauntingly beautiful composition for men's voices evokes a sense of wonder that enhances Yale Divinity School Professor Thomas Troeger's touching text of the Christmas story from the unique perspective of Joseph. 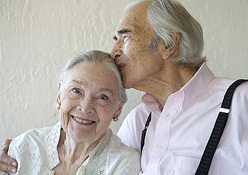 Dave and Iola Brubeck met as college students in California and were married for 70 years. It was a partnership in every way, as she managed his career and was a gifted lyricist whose poetry was sung by Louis Armstrong, Carmen McRae, Frederica von Stade, and many others. Among his many honors, Jazz pianist and composer Dave Brubeck was designated a "Living Legend" by the Library of Congress. The National Endowment of the Arts named him a Jazz Master and he was also inducted into the American Classical Music Hall of Fame. He first gained fame for his unique jazz piano playing and composition with the Dave Brubeck Trio and then the Dave Brubeck Quartet; throughout his career he experimented with interweaving jazz and classical music. The family moved to Connecticut in 1960 and raised their six children here in Fairfield County. La Fiesta de la Posada: A Christmas Choral Pageant is Mr. Brubeck's most frequently performed choral concert work. An evocation of a Mexican Christmas festival, it is infused with authentic Mexican folk music. 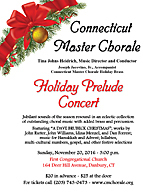 We will perform three selections: the vibrant "Gloria"; a serene lullaby "Sleep, Holy Infant, Sleep"; and "God's Love Made Visible" in the distinctive Brubeck 5/4 time. A recipient of both a Grammy and a Dove Award, Mr. Clydesdale is a composer, arranger, orchestrator and producer. He has given the Advent text from Isaiah 40:3-5 a new and dynamic setting that magnifies the feeling of anticipation for what is to come. Memories of winter, family, and friends are recalled in the poignant and tender ballad from Idina Menzel's popular 2014 CD Holiday Wishes. This lovely song was co-written by Idina Menzel, Charlie Midnight and Walter Afanasieff, who was also the album producer. With two Tony Awards and many nominations for best actress in a musical, Idina Menzel is also well-known for her work in films and television. An exultant arrangement gives new life to this traditional spiritual, celebrating the birth of "Little baby Jesus, born in a stable". Along with some other Christmas songs from the South, there is a focus here on the paradox of joy at the birth of Jesus combined with the sad knowledge that he will die on a cross in Jerusalem. Many artists and writers have taken this song and made changes to suit their own purposes, including the folk music icon Odetta, who turned it into a plea for peace, and Richard King, who made it into a lullaby. Arranger Joseph H. Jennings, who was the Music Director of the elite men's choral ensemble Chanticleer for 24 years, has created an animated celebration that includes parrots talking, mice prancing, and his own cat Lupie dancing. Award winning composer Nick Myers has created a piece of extraordinary sensitivity. A 2012 graduate of NYU's Graduate Musical Theatre Writing Program, his stunning a cappella work for women's voices evokes memories of a quiet, snowy winter night "while all the world's asleep". This talented compositional team of choral works has created a new and exciting Gloria, using a traditional text in Spanish, and dedicated "to our parents who encouraged our love for music". Popularized by Bing Crosby and the Andrews Sisters, this tender holiday standard has been given an elegant jazz-flavored setting, perhaps in tribute to the composers who were jazz musicians. It has also been recorded by such varied artists as Frankie Laine, Al Martino and Frankie Avalon. Composed for Frank Sinatra in 1954, and premiered as the B side of his White Christmas recording, this holiday favorite has been performed by more than forty famous artists including Rosemary Clooney, Tony Bennett, Harry Connick, Jr. and Barry Manilow. 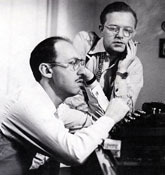 The great songwriting team of Styne and Cahn also wrote such classics as "Time After Time" and "Let It Snow". The great John Williams has more Academy Award nominations than any other living person and has won five times. He is best known for his film scores - especially for the movies of Steven Spielberg and George Lucas - but he has also written concert pieces and the themes for several Olympic Games. Leslie Bricusse, a successful composer and lyricist of stage and screen musicals, has won two Academy Awards. With this distinguished and prolific team, it is no surprise that this song, written for the movie "Home Alone", was nominated for an Oscar in 1990. Filled with nostalgia, it captures timeless beauty and reminds us of the innocence and magic of childhood. A Christian music singer and songwriter, Geron Davis is best known as a composer of hymns and religious music, in Gospel and other styles. He tours the country with his wife Becky, and his sister and her husband as the group Kindred Souls. "A King Is Coming to Town" is from his musical Tonight, an exhilarating gospel celebration of the Christmas story. * Our program includes three pieces by the extremely talented Dan Forrest. You may be interested in this brief interview in which Mr. Forrest explains his inspiration and how "Every Composer Has A Season".